Ring slings are made from a length of intricately woven fabric, secured on the shoulder through a set of rings. 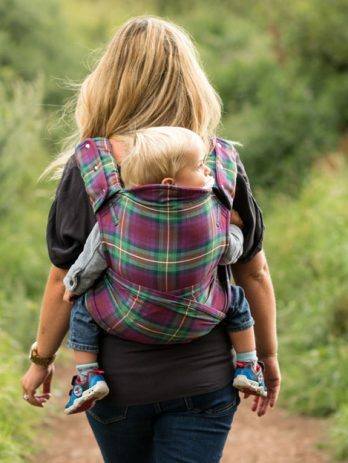 Quick to use, they are perfect for carrying your child on short trips and for children who like to be up and down often. 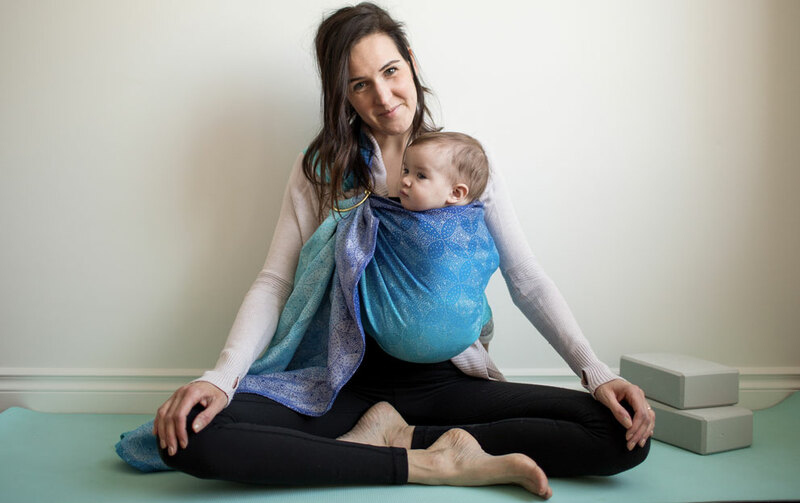 Learn more about ring slings. As ring slings are worn on one shoulder, so sometimes you will see an option for a left or right shoulder sling, but how do you know which to choose? Read on to learn how to make the right choice for you. What is a left handed or right shoulder sling? 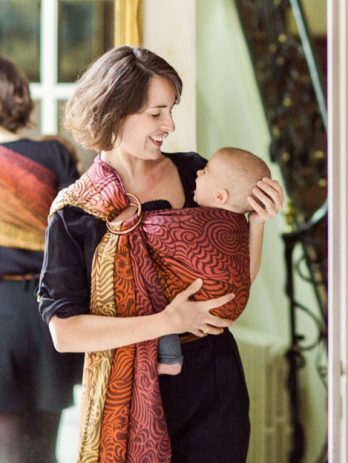 Our fades of colour and some of our patterns are directional, meaning the slings have a top and a bottom. If this is the case, you will be given a ‘left shoulder’ or ‘right shoulder’ option. 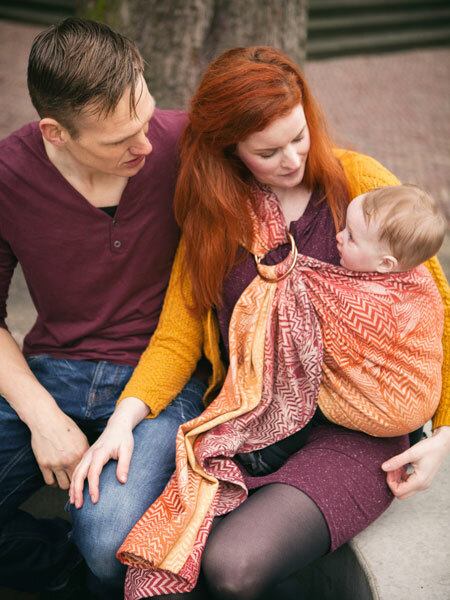 ‘Left or right shoulder’ refers to the position of the rings on your shoulder, if you choose a left shoulder sling the rings will sit on your left side with the baby in the centre or on your right hip. Sekai Sail Pleated Ring Sling – this is directional pattern on a fade. Pictured is a left shoulder ring sling. Not all of our slings will have this option. If you don’t see it listed this means the sling is not ‘directional’ and can be worn on either shoulder. Do I want a left or right shoulder sling? The first thing to consider is where would you like your baby positioned? Newborns need to carried centrally and upright on your body, and this can be achieved with either left or right handed styles. For older babies and toddlers, a hip carry is often the favourite position used with a ring sling. Imagine which side you carry your baby on, and the rings will sit on the opposite side. Most wearers will prefer to carry their little one on the hip which they natural pop them onto when not wearing a sling. This means if you want to carry your baby on your right hip, you would need to choose a left-handed ring sling. Don’t have a little one to try with? Give it a go with a heavier teddy or doll and see which hip you find comfortable. Can I choose the wrong shoulder? Choosing the ‘wrong’ shoulder does not have an effect on the use, or safety, of the sling, it simply means the pattern may be upside down or the bottom of the fade of colours will be at the top. Sometimes you might want to choose the wrong shoulder to have a different colour at the top of the sling when in use. 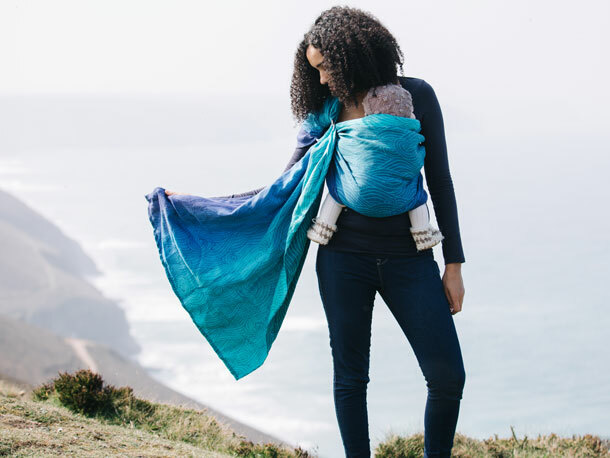 For example, if you wanted the dark blue of Starry Night Ocean to be at the top of the sling you would choose a right shoulder sling to be worn on with the rings on your left side. 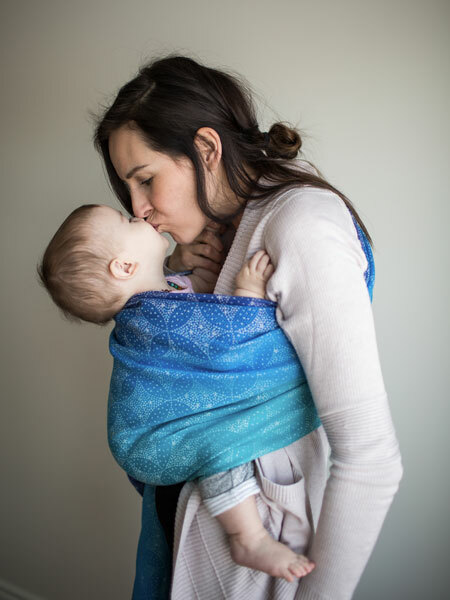 Starry Night Ocean right shoulder ring sling with the rings worn on the left side.